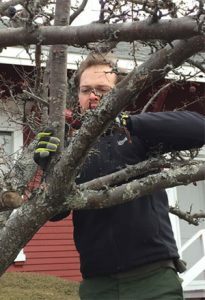 Pruning Course participant Gordon Lyman practices pruning a crabapple tree. This workshop is geared toward the back-yard gardener as well as those working in a related field. Saturday, March 24, 8:30 a.m. – 12:00 p.m.
Saturday, March 31, 8:30 a.m. – 12:00 p.m.
Saturday, April 7, 8:30 a.m. – 12:00 p.m.
Saturday, April 14, 8:30 a.m. – 12:00 p.m.
Saturday, April 21, 8:30 a.m. – 12:00 p.m.
On each of the four days, we’ll be spending part of the session outside pruning. Please dress appropriately for the weather. Bring a thermos of something hot to drink. If you are going to purchase new tools and don’t know what kind to buy or where to get them, wait until after the first class. If you are a person with a disability and need an accommodation to participate in this program, please call Sue Baez at 207.667-8212 or 800.287.1479 (in Maine) to discuss your needs. Receiving requests for accommodations at least 10 days before the program provides a reasonable amount of time to meet the request, however, all requests will be considered.